Stephenie Meyer seems to be one of those Marmite authors; you either love her or hate her, or her work just isn't for you so you tend to not touch it. I belong to the latter. I liked her Twilight series the first time that I read the books but not so much the second time round when I'd matured a bit. The Host had been on my to-read list for a while but didn't remember about it until the film adaptation (which I won't be watching any time soon) was announced. It's an established fact that I love aliens, and the book seemed like a very interesting take on it (at first it sounded a little bit like Invasion of the Body Snatchers to me) so I borrowed it from the library hoping for it to be good, but not exactly earth-shattering. It all just went wrong for me to the point that I had enough and gave up. I got nearly halfway through The Host where the book's biggest problem came to my attention. Nothing was happening. There was so little happening in the story that I actually fell asleep while reading. I fell asleep. I had never done that in my entire life until that point. The story was actually quite promising up until Wanderer and Melanie reached the caves and then everything just slowed down to a snail's pace. I read up to chapter 28 and the caves aren't seen until chapter 13 so that's approximately 159 pages of blah. Even 100 pages would have been too much. There were little points of things happening but they were only fleeting moments. I did enjoy the part when Wanderer is telling Jeb and the others about all the planets that she'd been on, but that was pretty much it. I couldn't have taken any more of very little happening and I didn't have the patience to trudge through waiting for something to happen. 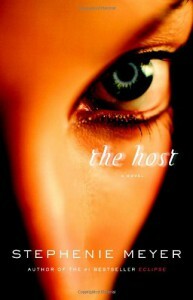 The sort of sad part about my experience with The Host is that I liked the vast majority of the characters. Melanie irritated the life out of me whenever she said anything and after all of the fluffy flashbacks, Jared was an intolerable douchebag. I can understand that he would be xenophobic against extraterrestrials, but it was just taken way over the top. I mean, there is no need to constantly call Wanderer "it" or a "thing" because aliens have sexes and genders too (I'm presuming her species does because in some series there are gender-less species). Whenever he went away, I was actually glad that he wasn't there to be intolerant and test my patience. Melanie, on the other hand, did a 180 on me. At first, I thought that she was going to be tough and maybe a little feisty, since the book's summary tells us that she "refuses to fade away". She did do that at first but as soon as we get to the caves "OMG JARED'S HERE! HE'S PROBABLY GOING TO KILL US BUT I DON'T CARE BECAUSE HE'S JARED AND I LOVE HIM!" Really, Meyer? Really? I'd expected better. I'd never really thought much about Meyer's writing style until reading The Host. I thought that it wasn't very well suited for the genre. It's very well suited for the Twilight series, where it captures all of the flowery feelings that are associated with falling in love for the first time, but for science fiction it was really out of place and incredibly fluffy. And since there was little to no romance in the part that I'd read, it was too purple and out of place. I've read some of the more negative reviews on Goodreads to see how it ends, and I think it's safe to say that I won't be returning to The Host any time soon. I couldn't put up with this mind-numbing torture for another second and was ready to just throw it into a wood-chipper but I really shouldn't because the copy I was reading was from the library. So, while this gets a big fat DNF, I'm going to look for some good science fiction to read.